Motor vehicle accidents are one of the leading causes of serious bodily injury among Americans. The effects of a car accident can be devastating phyically, mentally, and financially. 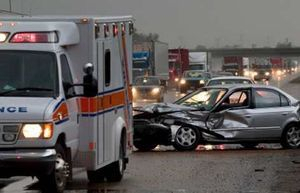 If you or a loved one have been injured in an automobile accident, you need an experienced attorney fighting for you. Accident victims often say that they feel stressed, intimidated, and alone while fighting insurance companies following an accident. These insurance companies will often try to settle with an accident victim quickly and for pennies on the dollar. This could be tens of thousands of dollars less than what your case may be worth, and what you are entitled to under the law. First, make sure all parties involved are not in need of medical attention. Second, call the police and, if necessary, medical assistance. It is important to involve the police at this point in time. A police report will be crucial in establishing the at-fault party for insurance purposes. It will also provide you with the other driver's insurance information and identification/ contact information. Third, it is always advisable to seek medical attention immediately. Even if there are no apparent injuries, there are often internal injuries that may not become apparent girl some time. Only a medical professional can determine if you have suffered such an injury. Fourth, DO NOT contact your automobile insurance company until you have met with Matthew Hornsby. If is important to have an experienced car accident attorney fighting for your rights with the insurance company from the very beginning. Matthew will assist you in filing your insurance claim and negotiate with the insurance company on your behalf. Dealing with the effects of a motor vehicle accident is never easy. However, having an experienced car accident attorney on your side will allow you to focus on getting better and moving on with the business of life, while not sacrificing the money your injuries demand. Call Matthew at (205) 856-1000 or email him at matthornsbylaw@att.net today to schedule a free consultation.